These penguin dominoes are a bit pricey, but they’re heirloom quality and have such a colorful, adorable twist that they’re worth it. This chunky and sturdy penguin domino block set is perfect for little hands, helping to teach cause and effect and logic through hands-on play. Your child can set up the dominoes, arranging them to go upstairs, downstairs, or in a wide circle — then the fun really begins as your little one knocks the penguins over with a ball, swinging beam or simply with a little push. 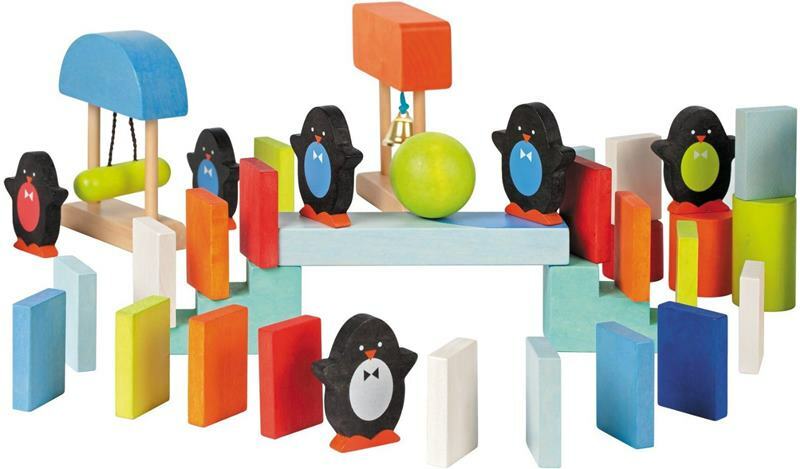 Your tot will watch in amazement as all the blocks and penguins fall down and then start building all over again. 100 wooden pieces are included for endless entertainment to create different sequences over and over again. Creativity and critical thinking come into play time and again as do fine motor skills, innovation and cooperation when your child plays with a friend. The entire set includes 40 darling penguin blocks, many colorful dominoes, planks, cylinders in various sizes, 2 sets of stairs, doorway, bell tower, windmill, swinging pendulum and ball. This fun domino set is designed in France and made with real wood, plus finished with non-toxic water-based paints. All Janod toys are manufactured with strict quality and safety standards, meeting both European and Australian requirements. These penguin dominoes are a bit pricey, but they're heirloom quality and have such a colorful, adorable twist that they're worth it. This chunky and sturdy penguin domino block�set is perfect for little hands, helping to teach cause and effect and logic through hands-on play. Your child can set up the dominoes, arranging them to go upstairs, downstairs, or in a wide circle -- then the fun really begins as your little one knocks the penguins over with a ball, swinging beam or simply with a little push. Your tot will watch in amazement as all the blocks and penguins fall down and then start building all over again. 100 wooden pieces are included for endless entertainment to create different sequences over and over again. Creativity and critical thinking come into play time and again as do fine motor skills, innovation and cooperation when your child plays with a friend.�The entire set includes�40 darling penguin blocks, many colorful dominoes, planks, cylinders in various sizes, 2 sets of stairs, doorway, bell tower, windmill, swinging pendulum�and�ball.�This fun domino set is designed in France and made with real wood, plus finished with non-toxic water-based paints.�All Janod toys are manufactured with strict quality and safety standards, meeting both European and Australian requirements.